The Vision 2025 released to the public in August as well as the Economic Policy Statement delivered in Parliament in October has reiterated the Government’s commitment to maintaining a low inflation regime in the country. This is not unusual since all governments have made the same promise to the electorate since independence in 1948. But what is important in the present case is that the Government has elaborated on the strategy to be followed in delivering this promise to the people. That is to give a free hand to the Central Bank to push the inflation rate to a low level through a strategy known as ‘Inflation Targeting’ or in short, IT. The Economic Policy Statement has pronounced a two-pronged strategy to keep the prices down. One is to manage the supply of foods to the market in abundant quantities by improving the domestic supply chains and, whenever there is a shortage due to poor local production, fill the gap by importing foods while cutting import duties on same. This is a strategy to improve supply to ease the cost of living of people. Though the statement has not explicitly said so, it requires the Government to exit the strategy once the conditions in the availability of foods become normal. And also, it is a measure which the Government should take to address the question of temporary increases in prices due to shortages in supply. The same strategy of the Government had been pronounced earlier in Vision 2025 as well. It had said that the Government would introduce necessary legislation to facilitate the Central Bank to adopt an inflation targeting policy. Thus, the two-pronged approach of fighting inflation is for the Government to manage the cost of living in the short run, while allowing the Central Bank to check inflation in the long run. The Government would do so by increasing supply; the bank would do so by curtailing demand. This is in fact a sound policy strategy. Keeping inflation at low levels in the long run is a responsibility of the Central Bank. The bank does so by managing the credit levels and interest rates – a measure known as adopting monetary policy. Accordingly, when inflation is raising its head, the bank will cut credit levels and increase interest rates to force the Government, companies and people to consume and invest less. The objective of this measure is to allow the total demand – known as aggregate demand – to rise in line with the total supply or aggregate supply. This is known in economic parlance as restrictive or contractionary or tight monetary policy. If on the other hand the prices are falling too fast due to the aggregate demand being short of the aggregate supply, the bank will ease its monetary policy by cutting down the interest rates and allowing credit to grow. It will persuade the Government, companies and people to consume and invest more. Such an increased demand for consumption and investment will absorb all the goods and services supplied in the economy. But the problem arises not when the bank has eased monetary policy but when it has tightened it. Its tight monetary policy will restrict the aggregate demand of companies and people. However, the Government, an important entity in the system, may continue to consume unrestrained by borrowing from the banking system and from abroad. It will certainly negate the effectiveness of the bank’s monetary policy. Thus, in the end, despite the bank taking tight monetary policies, the country will be saddled with the problem of high inflation. The culprit in this case has been the Government, which does not fall in line with the monetary policy being implemented by the bank. In the present environment, the Central Bank cannot dictate terms to the Government. Rather, it operates in the opposite way where the Government is dictating terms to the Central Bank. The bank, like the proverbial ‘good wife’, has to accommodate the demands of the Government for funding, even when it knows that such demands arise from the profligacy of spending by the Government. This may be puzzling to many who believe in the independence of a central bank. The answer to this puzzle is reported to have been given by one-time Reserve Bank of India Governor, Y. Reddy when he was questioned about the independence of the Reserve Bank by a journalist at a press conference. He is reported to have responded in the form of a pun: “The Reserve Bank is independent, autonomous and not being controlled by the Ministry of Finance. Gentleman, I have permission from my Minister (of Finance) to tell you this”. To resolve this issue, it has been suggested that central banks should follow an inflation targeting policy. It differs from the current monetary policy strategy of the Central Bank. In the current policy, the Central Bank seeks to control inflation by controlling money, credit and interest rates. This is a strategy to attain a final target by controlling some intermediate factors. The success of these intermediate factors will crucially depend on how the Government behaves. If it follows a policy of supporting the bank’s strategy of controlling the intermediate factors, the bank will be able to attain its final target as well. But if it works against it, the outcome will be a failure on the part of the bank to deliver price stability to the country. Hence, under inflation targeting, the bank will go for the final target rather than spending its time in attaining some intermediate goals. Accordingly, a central bank will agree with the government a low inflation target of about 2% and pursue its policy in the subsequent period to maintain inflation at that level in the economy. It, thus, gets independence from the government to tight or loosen its policy in accordance with the conditions emerging in the economy. If the inflation rises above 2%, the bank will immediately increase interest rates and control credit levels. This would happen no matter whether the Government is short of funding or whether the Government is planning to go for an election. In the reverse, if the inflation rate falls below 2%, the bank will loosen its monetary policy by cutting interest rates and stimulating credit. It therefore gives a flexible hand to the Central Bank to use its discretion independently of what the Government feels. In this situation, the right to conduct monetary policy is solely vested with the Central Bank. As such, an irate Minister of Finance cannot publicly criticise what the Central Bank does. 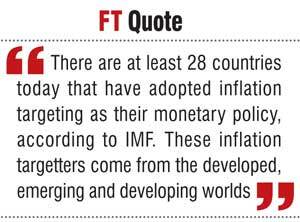 There are at least 28 countries today that have adopted inflation targeting as their monetary policy, according to IMF. These inflation targetters come from the developed, emerging and developing worlds. The leading inflation targetters from the developed world are Australia, New Zealand, Canada, United Kingdom, South Korea, Norway, Sweden and Israel. From the emerging world, South Africa, Thailand, the Philippines and Brazil have chosen inflation targeting as their policy framework. Ghana, Serbia and Armenia have been some developing countries which have adopted inflation targeting. The Central Bank of Sri Lanka started to work on inflation targeting in early 2000s when it had embarked on a project to modernise itself. It had done initial work on the project with support from Sweden’s Svergis Riksbank, the Central Bank of Sweden, which had already adopted inflation targeting as its policy framework. Since the bank cannot be both the judge and the player in this game, it had stopped compiling price indices and GDP data and had allowed an outside body, the Census and Statistics Department, to do the job. To facilitate this, the Census Department commenced releasing both inflation numbers and GDP data on time according to a set advance release calendar. But, due to a lack of any support from the Government in power at that time, the Central Bank could not attain much progress in the project. It was virtually an abandoned project until it was rediscovered in 2016 by IMF when it rescued Sri Lanka by offering an extended fund facility to the country. To obtain the facility, the Sri Lanka Government had pledged to IMF that it would introduce both a flexible exchange rate regime and an inflation targeting framework over the next three-year period. The Central Bank too in a special box article in its Annual Report for 2016, released in April 2017, had emphasised the need for introducing inflation targeting as the country’s monetary policy framework. In this background, the assurance given by the present Government that it would facilitate the Central Bank to adopt inflation targeting as its monetary policy framework is a salutary development. Inflation targeting will help Sri Lanka to make its monetary policy transparent, stick to a consistent policy target and deliver low inflation to the country, a must for it to facilitate long-term investment in the country. Right now, the monetary policy is opaque. While the bank puts a very bold face to the private sector when it tightens the policy, behind the scene, it accommodates the Government’s funding requirements by acquiring government Treasury bills. These data are released to the market only with a time lag of one week when it releases its weekly economic indicators. Even then, not many in the private sector are able to interpret them. In the monthly monetary policy statement, the bank very conveniently chooses not to make any comment about it. This opacity in monetary policy will be removed when it goes for inflation targeting since it cannot accommodate the Government’s funding requirements stealthily while showing a bold face to the private sector. Of the 28 countries which had adopted inflation targeting, not many have been able to stick to their promise. Countries like Sweden, Australia, New Zealand and Canada have been able to maintain inflation at the target levels. But many countries have missed the target range by about 45% of the time, according to a survey reported in a Working Paper released by IMF in 2005. This failure has been due to the Central Bank, the implementation agency of inflation targeting, not being independent from the Government. Thus, for the inflation targeting framework to be a success, a crucial requirement is that the Central Bank should be freed from the crutches of the Ministry of Finance. This requires the Government to introduce necessary legislation to that effect. Though Vision 2025 has promised it, it has not been mentioned in the Economic Policy Statement issued a month later. It has highlighted the virtues of inflation targeting but not about the changes that have to be put in place on the ground. 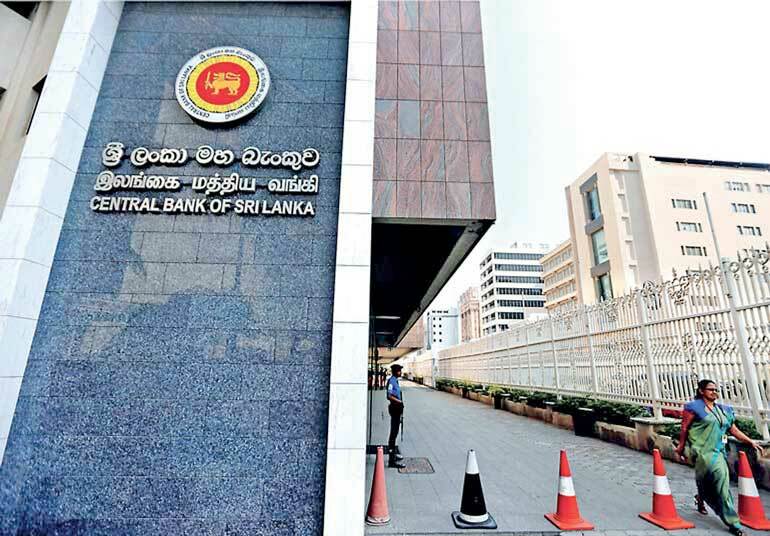 Hence, it is of the utmost importance that legislation to make the Central Bank fully independent be introduced before Sri Lanka adopts inflation targeting as its monetary policy framework.